‘Emotional blackmail’ is a loosely used term for anything where one person feels emotionally manipulated into doing something they would not ordinarily be willing to do. It takes several forms : crying, sulking, banging doors, not eating food, locking yourself up in a room, lamenting, cajoling, over display of affection, cold silent treatment, ignoring, sarcasm, taunts, nagging or a simple interaction like ‘what happened???? ?’…Answer : ’nothing’. 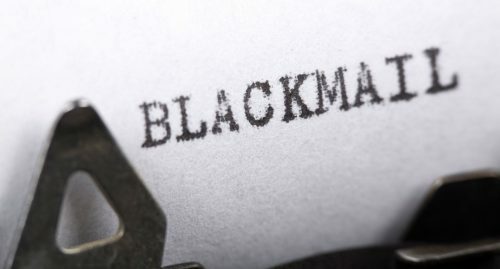 While all of this is familiar and when we are not immediate victims of this, even amusing, as a ‘way of life’, these emotional blackmails are what are called ‘subtle, psychological power plays’. According to Claude Steiner :” if I can intimidate you with threats or with the tone of my voice, I can push you into action by making you feel guilty, I can seduce you with a smile or a promise or persuade you that what I want is the right thing to do, if I can overcome your resistance without using physical force, I have used psychological power play”. These power plays vary in intensity and depending upon the people involved and the length of time for which they have been played, result in varying levels of outcomes almost always negative. I say ‘almost’ because sometimes the perception of the negativity of the outcome does not even register with the players as these are accepted as ‘part of life’. So I will now go on say the outcomes are ‘always negative’. A manager, unmindful of the small resentments that are building around his/her behaviour will have a high turnover of employees and will lament ‘it is just not possible to find good people’ or a doting father, who treats his daughter as ‘daddy’s little girl’ will be in for a shock when she rebels and goes against all his ideas of a ‘good girl’. Because unknown to each of us, what is being imposed on others are our dearly held beliefs and expectations of ‘how we want to see the other person’ and ‘what we think they should do’. Because these are accepted as ‘part of relationships’ and the twinge of bad feelings (being made to ‘do’ something under pressure can never be a happy, healthy experience) are often swept under the carpet, they accumulate over time. These are corrosive to the well- being and health of ALL relationships. Tears, frustration, helplessness, feelings of wrongdoing, martyrdom, sacrifices, of ‘I do so much and still…’, ‘why always me’ are all part of outcomes or ‘pay offs’ of these ‘power plays’. The term ‘power’ is mostly understood as one person dominating another through physical force, financial muscle or exercising some kind of control over the other person. However, emotional manipulations exercise an equally strong power in relationships and are a result of established patterns of stimulus response, intuitively picked up by both players over a period of time of their association. The wife knows when the husband is in a ‘good mood’ and can be asked for something or in a bad one and so to remain quite. The husband knows that if he wants to play golf over the weekend, which events in the week he needs to be present for with the family, to have a smooth exit on the weekend. These are ALL part of ongoing, subtle communication which is accepted in day to day life. How to deal with emotional blackmail? As mentioned, all such communication, at one level, is deceitful as each person is engaged in activities as per a ‘common minimum program’ and when the program runs its course, fights erupt and issues which till then were seemingly non issues, start getting dragged into the conversations. In Transactional Analysis and Emotional literacy, these are called ‘psychological games’ which always have negative and destructive outcomes. Emotional blackmail in relationships, these are played out over time in every household, though the intensity varies and so do the outcomes and the intensity increases with time as does the level of outcomes or ‘pay offs’. What starts as banged doors and sulks becomes late coming or staying away from home, from mild rebellion like wearing ear studs to drug and substance abuse, from fights behind closed doors to more public display of anger to divorce or death. However hard it may seem that there can be such a certainty of outcomes (they are certain for each established pattern in every home): which is how the mother knows when the husband or child is likely to go to bed without food, the child knows when a fight it about to start, the boss knows when the subordinate will not deliver on time, the manager knows when the sales team will not meet targets, they are certain, predetermined and unless consciously understood and broken in behaviour and action, will yield higher and higher intensity of negative outcomes. This whole understanding of ‘Games People Play’ and its outcomes was the cornerstone of Eric Berne’s work in Transactional Analysis. After his death in 1970, Claude Steiner, one of his students, carried forward the work, combining the growing knowledge in psychology, evolutionary sciences and neuro sciences, culminating in his work which he called ‘Emotional Literacy’. Is there a way to simply understand these dynamics and do something about them? That is the very purpose of Emotional Literacy. To explain how these patterns and behaviours have come about in each person’s life and to support them in understanding their own issues, their own anxieties and fears, frustrations and anger which are unique to them and to their circumstances. This work is intensely personal and does not have a ‘one template fits all’ formula though it gives a unique understanding and set of tools to start applying on one’s life to start clearing the many cobwebs that have collected in the heart and mind. What we do in day to day living is to live life ‘as best understood by each of us’, which is what our ‘emotional intelligence’ in a situation tells us to do. Unfortunately this ‘intelligence’ is trapped in an understanding of the world, which runs according to what are ‘acceptable’ norms of behaviour and communication: healthy and unhealthy, in each person’s environment. Any attempt at any deviation results either in conflicts or in suppression of real feelings and wants and a large number of unfulfilled needs: need for love, intimacy, communication, joy, sharing and permission to be one’s self and living a life of one’s own choice. The purpose of Emotional Literacy is to support each person in living a healthy life where it is possible to first understand your own needs and understand what is blocking its fulfilment. It means also taking responsibility for your own life, decisions and actions. I was confused when first asked this question. Isn’t ALL psychology about human behaviour? I asked my trainer this question and was told that this is ‘humanistic psychology’. It is understanding and compassionate towards people. It does not ‘analyse’ them but instead gives them an informed and patient hearing, allowing them to unravel their own needs, desires, wishes and showing the way for their fulfilment. Positive reinforcement increases feelings of OK.
All people have a basic lovable core and a desire for positive growth. « Publicité ciblée : comment s’en protéger ?